Although the Disabilities of the Arm, Shoulder and Hand (DASH) questionnaire is widely used in the UK, there were no British English version available until recently. We have linguistically validated the DASH into British English and then test the reliability and validity of the British English DASH, (including the Work and Sport/Music DASH) and QuickDASH, in people with rheumatoid arthritis (RA). Minor wording changes were made as required. The DASH addresses a quarter of Body Function and half of Activities and Participation codes in the ICF RA Core Set. 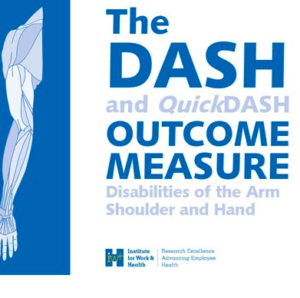 British English versions of the DASH, QuickDASH and Work and Sport/Music modules are now available to evaluate upper limb disabilities in the UK. The DASH, QuickDASH, Work and Sport/Music modules are reliable and valid to use in clinical practice and research with British people with RA. You can download a copy of the DASH-UK through this link. Please note below the copyright information. Here you will find more information about the DASH and QuickDASH Outcome Measures and related tools and products. Copyright: © Institute for Work & Health 2006. All rights reserved.